MDPAG was the link organisation and a member of the Manchester Disabled People’s Network, which was part of the Community Network for Manchester (CN4M). 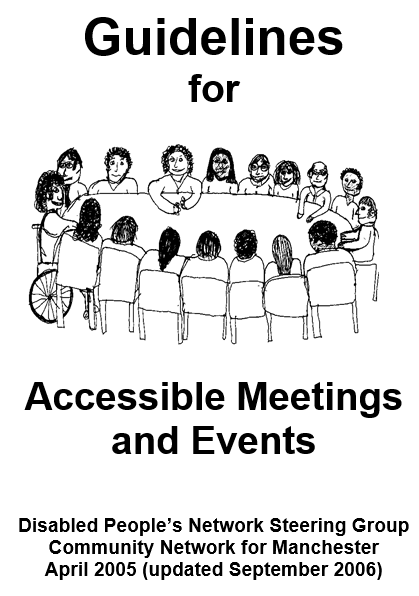 The Guidelines for Accessible Meetings and Events were initially published by the CN4M and are now available from MDPAG. This is complementary to Design for Access 2 and provides handy checklists and detailed advice and information for organising what happens within buildings and the environment. what to consider and plan for before meetings and events, including planning, publicity, checking people’s access requirements, expenses policies, accessible child care. what to consider during meetings and events, including organising for communication support, briefing presenters & workshop leaders, registration, accessible information, including clear print guidelines, organising food & drink, organising rooms. The guidelines are available in various formats, including Braille, large print, standard print, CD-ROM and audio tape and on the Internet. MDPAG has also produced Clear Print Guidelines and Terminology Guidelines. Please contact MDPAG for more information.